October in Minsk is jam-packed with events: top-notch theater performances, cinema festivals and science lectures in the bars. Here is your exhaustive guide to what makes autumn less stressful. International theatre festival gathers the best performances, marked by various awards. TEART focuses on experiments and artistic innovation in the theater. A traditional part of the theater festival is workshops, meetings with the creators of the performances, open discussions and much more. Speaking of the international program, we would strongly recommend you not to miss “Darkness Poomba” and “Arctic”. “Darkness Poomba” is a choreographic show about Korean national culture and its peculiarities depicted through dance and Pansori; and “Arctic”. is a political thriller featuring six characters trapped in someone’s plan devised to make them disappear. When: October 4, 7 p.m.
RSP (Razbitaje Serca Pacana / Lad’s Broken Heart) is an iconic Belarusian band whose songs are real portion of sarcasm and self-irony, so their live performances turn into a kind of absurd show, full of abnormality and eccentricity. RSP are going to present their new album about love (sure), but it will be not what you expect to hear. One of the main events for cinemaholics and art lovers. Beat Weekend Film Festival is a large-scale international festival of documentary films about the world of music, modern art, media, street culture etc. The program consists of main hits of the Beat Film Festival that includes dozens of full-length films and thousands of spectators every year, joint programs with curators and cultural institutions and so on. Check out films about the 101st Depeche Mode concert in 1988 or “Social Animals” speaking of Instagram society or, maybe, docudrama “Skate Kitchen” by one of the main Sundance directors on subcultures, youth and freedom. When: October 5, starts at 6 p.m. If you want to learn something in Astrophysics, Culture Studies, Ecology, IT or Brain Science and enjoy a glass of wine at the same time – this is definitely the place to go. Young scientists from Germany, Russia, Ukraine, and Belarus will perform in the bars of Minsk. 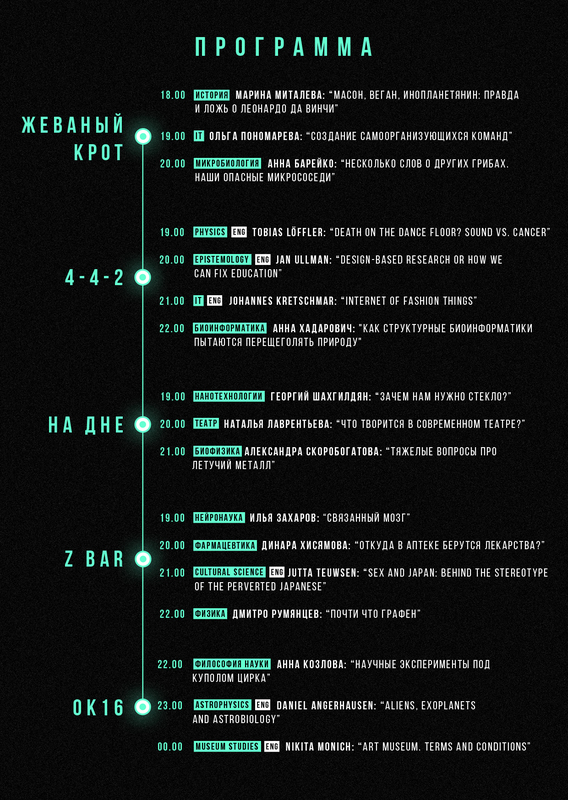 The event will be held in Russian and English (check out the program). When: every day till October 7, 6.30 & 9.30 p.m. Annual Manhattan Short Film Festival is again in Minsk – it’s the first global film festival, which simultaneously takes place in 300 cities of the world and annually brings together more than 100,000 short-meter fans to participate in an interactive vote to select the best film. Under the slogan “One week. One world. One festival”, starting from September 27, shows will be held simultaneously in America and Belarus, in France and South Africa, in Italy and Mexico, in Austria and Great Britain, in Russia and other countries. When: October 11, 7 p.m.
A unique concert at Prime Hall dedicated to the 35th anniversary of the band’s entry into the Leningrad rock club. Auktsyon is a unique phenomenon in the modern music scene. This band draws its inspiration from the sources of ska music, reggae, new jazz, ethnic music of North Africa and the Middle East, as well as the beat and pop music of the 60s. Auktsyon is a band-exception, their concerts are real rock and roll, real fun, but a bit creepy. When you ask what is most important at their concerts, the fans answer that the mood of the time. When: October 13, 11 p.m. – October 14, 9 a.m. The space where the industrial legends of the past were forged will embody the mood of the future. 2 dance floors will host a global rave JetFestival organized by the promoters who stood at the origins of the Minsk club culture: JetSounds and Re: Fresh. The headliners are Extrawelt and Steve Bug. When: October 16, 8 p.m.
Each concert of the Icelandic band GusGus is almost a ritualistic act played out by roles, where enchanted audience sways in trance, every sound pierces through the crowd, the voices of vocalists sound like from somewhere out of space, the musicians on stage are more like shamans, every harmony evokes images of mysterious landscapes “ice countries". It seems that after leaving the club on the street you will see the northern lights in the sky. Wizards from Iceland will present their new album at the largest club-type venue in Minsk. When: October 21, 7 p.m.
Dlina Volny is a Belarusian fresh cold-wave band, a reflection project on the post-Soviet reality with vintage keyboards and thrilling vocal. Advokaty is an esthetic synth rock band from Ukraine, simultaneously inspired by the LCD Soundsystem group and the legacy of the national new wave. If you are craving for good new music, don’t miss it! When: October 25, 7 p.m.
Ukranian one-girl project Dakooka has become a phenomenon of the modern pop scene. She can feel good in dark pop, funk, drum and bass, in electronic music, and in interpretations of oriental mantras. When: October 28, 12 p.m.. This large eco-market has grown into the full city fest. Except for the fair of eco food and cosmetics you'll find forward thinking lectures, sport games, workshops on making natural cosmetics and preparing healthy food, food court, yoga classes, children activities and so on. All of that accompanied by the music of Selderave!, Dj Papa Bo and others.